Home Date Interview Questions Medium Date Questions How to find day after N years in Java? Write a program in Java that finds a day after N years. For example - on 26th Jan 2017 day is Thursday and 10 years later on same date 26th Jan 2027 day will be Tuesday. The solution of this problem is very simple. With the help of Calendar class constant YEAR and DAY_OF_WEEK we can easily solve this problem. If you know how to find a day before N years then believe me guys this problem is a piece of cake. How to subtract years, months, weeks and days from given date? How to find day name of given date? How to convert Date to Calendar? * @problem Day after N years? // Adding years in Calendar. // Converting Calendar to Date. // Converting Date to String. Output - How to find a day after N years in Java? 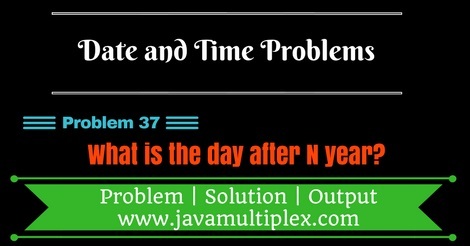 Tags : Date and Time problems, Day after n years, Solution in Java, DateFormat, SimpleDateFormat, String, Calendar, switch statement.